Migrant workers in Indian cities face a bleak future, but one organization is trying to bring hope. As the share of agriculture in India’s growing economy plummets, farmers from the country’s poorest regions are moving in droves to cities in search of better prospects. Many of them find work in the booming construction industry, which employs more than 30 million people. But the gleaming office towers and slick residential complexes they build stand in stark contrast to the tiny tin shacks where they live, often on the construction sites itself. Moreover, the obligation to constantly change sites and cities means that their children receive no education and are locked in a malicious cycle of poverty. 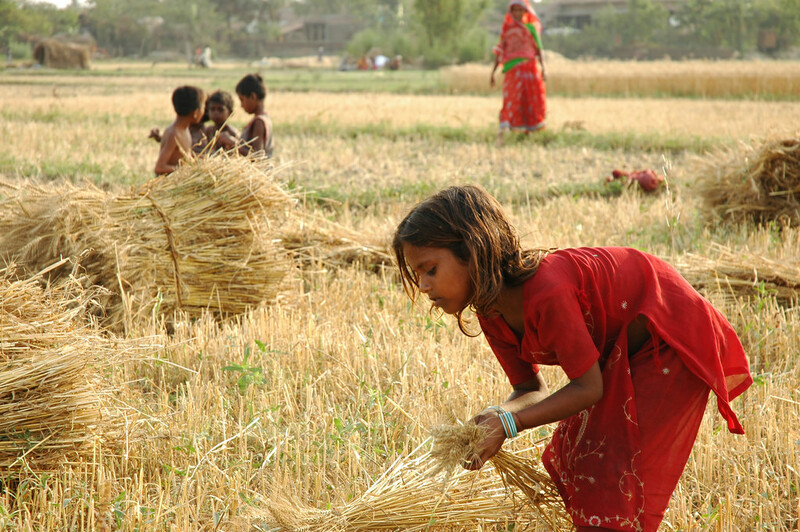 A child helps in harvesting the wheat crop in the Indian state of Bihar, where many construction laborers come from. Many farmers here do not own land, and instead work as daily wage laborers on other people’s properties. In recent years, lack of employment in agriculture, low wages and indebtedness have forced workers to look for alternative employment in other states. Many end up working on construction projects in big cities. 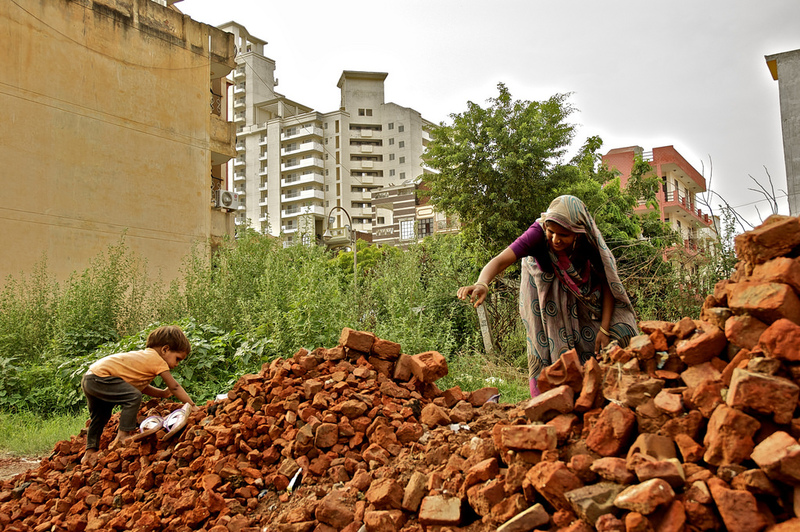 A woman on a construction site in Gurgaon, a suburb of New Delhi that has seen frantic construction in recent years as it scrambles to host the new middle class and multinational companies in India. Female workers have it particularly hard: they have to work on construction sites, with pay that is 40 percent lower than their male counterparts on average; care for their children; and manage household chores with limited resources. This mobile tanker is the only source of water for thousands of migrant families who live in this vast construction site, near New Delhi. Despite laws requiring construction companies to provide a minimum wage to their employees, migrant workers are underpaid and have little or no access to basic services such as medical care, water facilities and private latrines. 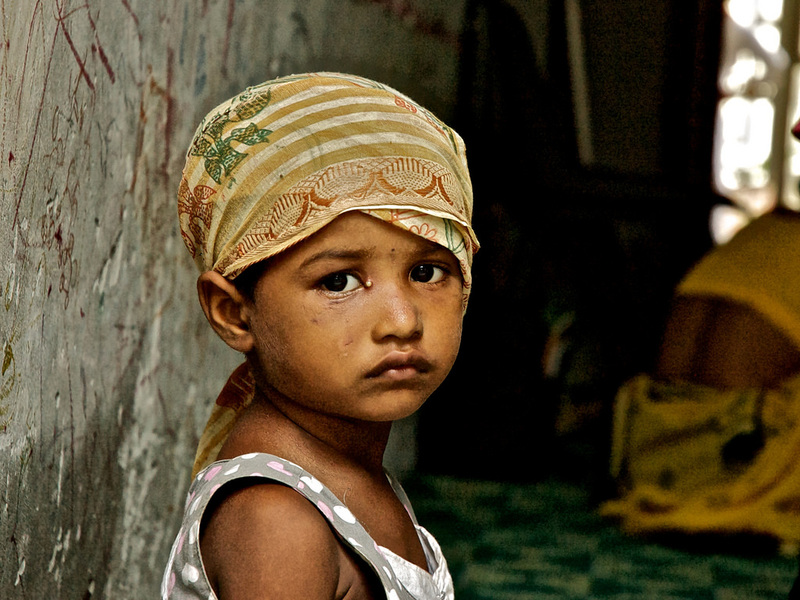 A child in one of the few crèches in the suburb waits for her mother to return from work. Indian law provides that any company employing 50 or more women must have a crèche. Yet many construction companies flout the law. Children are left to fare for themselves while their mothers are working. Many mothers are unable to breastfeed their babies, and often have to leave them with their elder siblings. 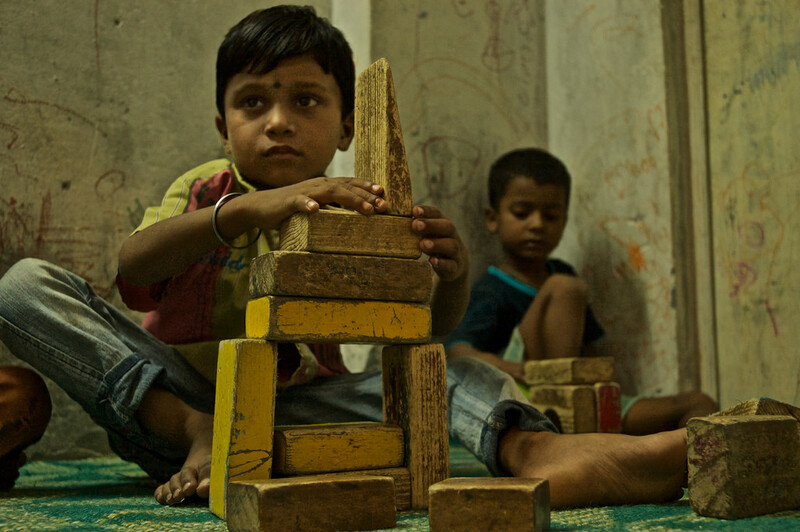 A study conducted by Mobile Crèche, a New Delhi-based organization that provides nursing services at construction sites, estimates that almost 70 percent of children of migrant workers are under nourished. 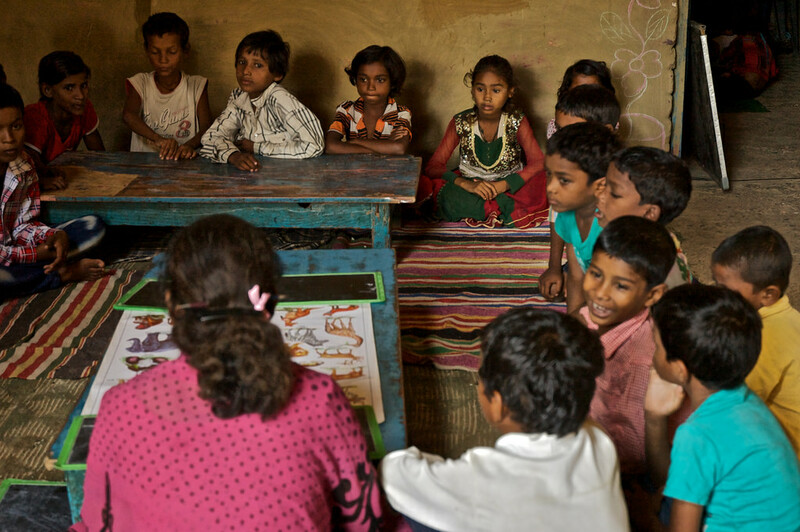 Mobile Crèche organizes classes for migrant children at the construction site so that they can stay and learn while their parents are working. 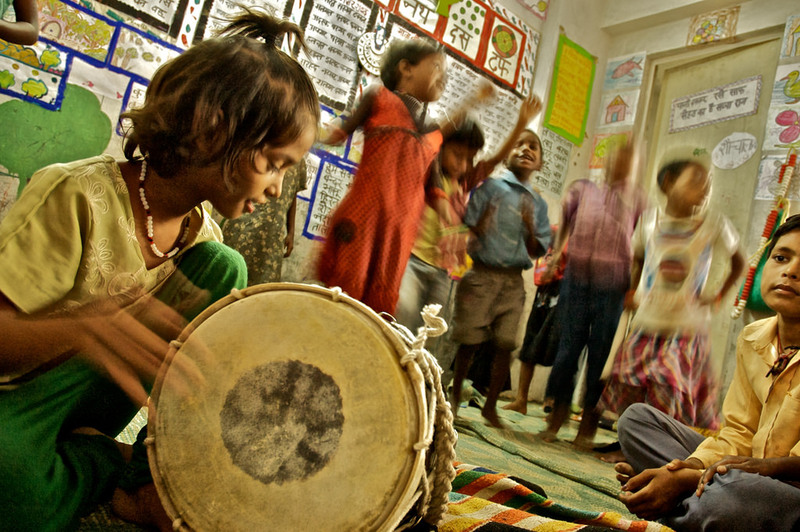 The organization runs around 25 daycare centers in the Delhi region, and caters to children of all ages. It also prepares and assists older children in the transition to formal schooling. 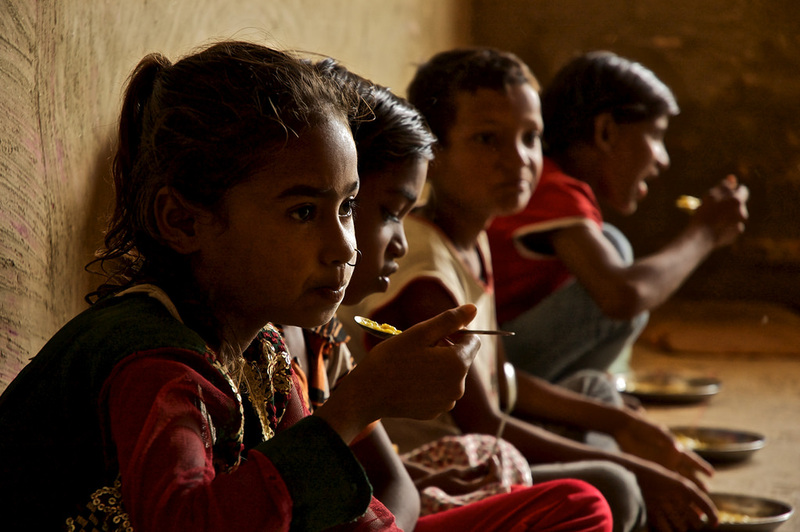 Children break from their busy schedule to have lunch. At almost all day care centers run by Mobile Crèche, children are given a protein-rich diet consisting of lentils and rice. The organization ensures that women are permitted to leave work two times a day to feed babies. A group of children practices for an event organized by Mobile Crèche. Soon they will perform in front of an audience including their parents, filling them with pride as they frolic on stage, offering hope of a better life for their children.